On saturday I went to The Great Wetherby Racecourse Antiques Fair with some friends. It was the first time I’d been and had a brilliant time browsing amongst all the fabulous things. We were mooching around one of the stalls when we happened across this rather splendid object. It was marked up at £55. We pondered over what it could be for some time. The glass prism rotated by means of the circular brass knobs, and was attached to a brass tube about an inch across. There were a couple of what appeared to be lens holders which could be swung into position in front of the prism, and the bottom of the brass tube had two little spikes, as if on a gun sight. The circular bit you can see at the top right is a tiny little bubble spirit level, and underneath, the three legs had a circular groove cut into them. It was clear then, that this thing sat atop something else, something circular, that had to be level. We pondered some more. Some kind of navigation device, perhaps? We retired for tea and a delicious sausage butty in the catering tent, before continuing our wandering around the fair. Now, me, I like a challenge. I fired up Google on my phone, and tried various searches. “Brass tube prism” suggested a spectrograph, but on further research it wasn’t that. I tried a few more things – navigation, sun, prism, all to no avail. We found ourselves back at the stall. The chap was quite amused to see that we were still so intrigued. “Could I interest you at the right price?” he enquired, hopefully. Sadly, he was mistaking our interest – we were fascinated by the thing itself, fascinated by the mystery of what it was. It was a lovely object, but I was well aware that I had no need for it, I had nowhere to put it, and (most importantly)I didn’t have £55 to spend on it! aha! Something to work from. 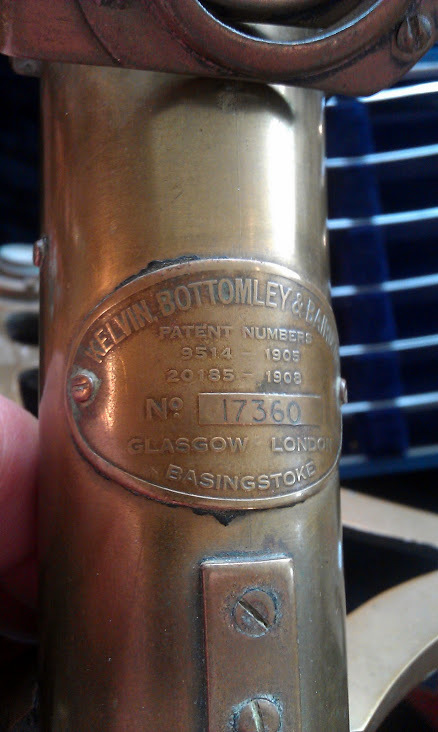 Kelvin, Bottomley & Baird, according to Google, were scientific instrument makers from 1913 to 1941. It was the patent number which uncovered the mystery though! 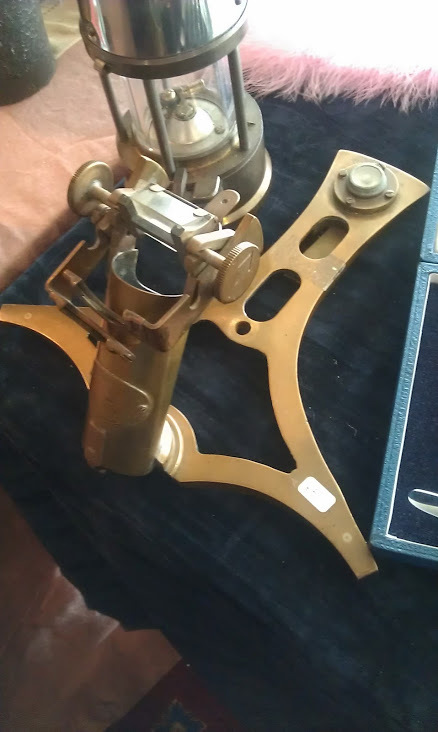 It’s a Sir W Thompson patent azimuth mirror, used for navigation. Sir W. Thompson went on to become Lord Kelvin, the first UK scientist to be elevated to the House of Lords and famous for his work in thermodynamics. An azimuth mirror is fitted on top of a ship’s compass, which is mounted on gimbals, hence the bubble spirit level, and is used to taking bearings. Full instructions are here, on the Harvard University website, if you can make head or tail of them! Fascinating stuff.